Disclaimer: Quinns, of this site, was a paid consultant on this game. Originally we weren’t planning to cover it, but ultimately decided to send it to Pip for an impartial review. Mechs vs Minions is REALLY good! The developers bill it as Robo Rally meets Descent to give you an idea of how it plays. I’ve been playing through the campaign with Chris Thursten. We’re having a blast and I’ll get into the more detailed explanations in a moment BUT! I wanted to say how much we’re enjoying it up here because the game is an episodic campaign with each mission coming in its own envelope so as to deliver a few surprises as you play. With that in mind I figured it would be best to say “It’s so good!” up front in case you wanted to go in with as close to zero knowledge of the contents of the game. Quinns forwarded Mechs vs Minions on to me because I play League of Legends and thus can offer that perspective. I was delighted. My postman was less delighted as there’s a bit of a walk from the road to my front door and the game weighs 12.8lb plus a bit of packaging. That is more than a newborn child. Or, if you prefer, somewhere between a common long-nosed armadillo and a six-banded armadillo. As soon as you take the lid off the game it has the feeling of a kind of over-the-top luxury extravaganza. The individual pieces are packed into little plastic trays so everything has a little home when you put it away, rather than being in a worrisome jumble, and the plastic trays even have their own ornate lids. There’s a sealed box towards the bottom with an axe blade poking through, hinting at perils to come, and a LOT of tiny, wash-painted minion figurines. More on those in a bit. The thing I’m getting at here is that opening up the box is an experience in itself, going through all the layers and identifying all the parts like it’s an ultra-fancy chocolate selection box. 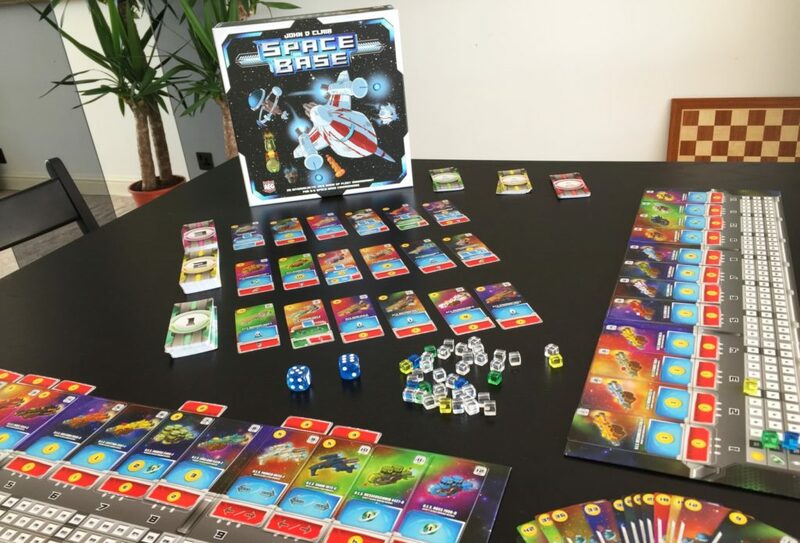 The game changes from mission to mission over the course of the story campaign, but the kernel is always the same: you have a playspace consisting of some combination of modular boards, you have an objective to fulfil as a team, and you each have a mech which you control. To use your mech you have a command line board with six slots, into which you put cards which specify movements or attacks or perhaps both. Over the course of a turn, you’ll have a draft phase where you get a selection of these command cards to pick from, then a placement phase where you pick the slots to put them in, and then an execution phase where you work your way from left to right, executing each card’s instructions in order. I’m reluctant to call it programming, because I traditionally loathe games which do that bright-eyed, bushy-tailed “You too can learn to program but we made it fun!” thing. Mate, if I’d wanted to learn to program, I would have learned to program. Stop trying to put me on work experience! Mechs vs Minions isn’t like that because it’s such a simple THIS then THIS then THIS format at heart. It’s more of the logic/problem solving side of programming and you come to understand the ways in which you can manipulate the command line really quickly. From that point you can start making more complicated moves. 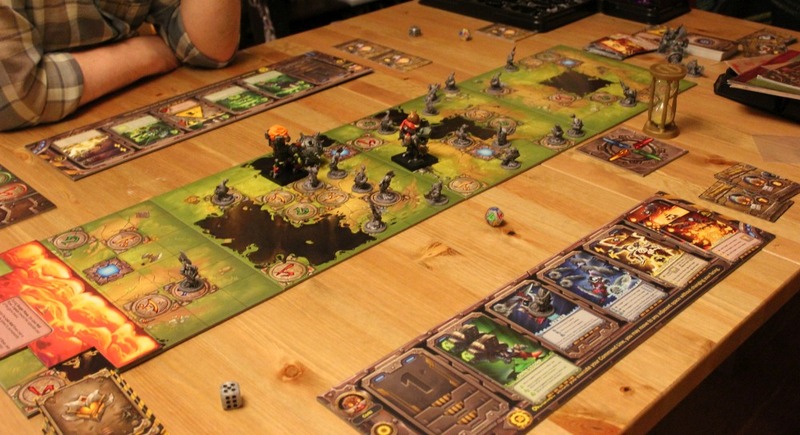 Once you’ve pootled around the board (sometimes purposefully, sometimes facing the wrong direction and crashing into things depending on how your game is going) it’s the turn of the minions. The minions of League of Legends (the videogame) are the smaller non-player characters that trundle along, helping one team do damage to the other. They’re not smart, but they can chip away at your health if they end up near you and can be pretty dangerous if you’re weak or if they’re clustered up in a big group. That’s something Mechs vs Minions recreates well. These little grey units move according to rules specific to the mission, then more of them spawn (again, according to the specific mission) and then they do damage. If you’re in the line of fire you draw damage cards which have the capacity to mess with your command line in interesting ways. Sometimes it’s a one-time irritant like swapping the cards from one slot with another slot and thus messing with your move order, sometimes it’s an every-turn-until-you-fix-it thing like the card which covers one of your command spaces and makes you rotate 90 degrees to the right instead of what you put in that spot, potentially sending you careening off into a swarm of minions. After that some missions have a danger phase where you activate an additional threat like a boss minion or a rolling wall of lava. Then it’s back to the player phase and you rinse and repeat for as long as the game lasts. There are also other doodads which offer options for healing or strategising. For example, after drafting cards you can either slot them into your command line OR you can discard them to repair or reorganise your command line. Your character will also usually have schematic cards which offer bonus abilities, like allowing a move that usually only sends you forwards or sideways to now offer a backwards option. Those unlock after you’ve killed a certain number of minions. If you kill 75 minions over the course of the game each character has a unique ability which kicks in and offers further assistance. You can also stack cards of the same type (metal, fire, electricity and computery) in command slots which allows you to access souped-up versions of their abilities. A solitary speed card lets you move one or two spaces forward, but a speed card on top of another electricity type card lets you go 2-4 spaces, and if it’s on top of TWO other electricity type cards you can go 3-6 spaces. Other cards might mandate that you turn 90 degrees, but you get to pick which direction at level one. You can generally make those cards offer more wiggle room (technical term) by piling them up and thus softening the blow of non-advantageous turning. 90 degree turns generally level up to become a “90 degree or 180 degree” turn and peak with a “face any direction you like” option. Once you’ve mastered all this you start deploying strategies. A couple of missions in I would read the mission briefing and change how I played accordingly. I’d pick schematic cards which I thought fitted what we might need to do – ones to help with movement if we were racing across the board, or ones to help us shrug off damage if we were up against the boss. 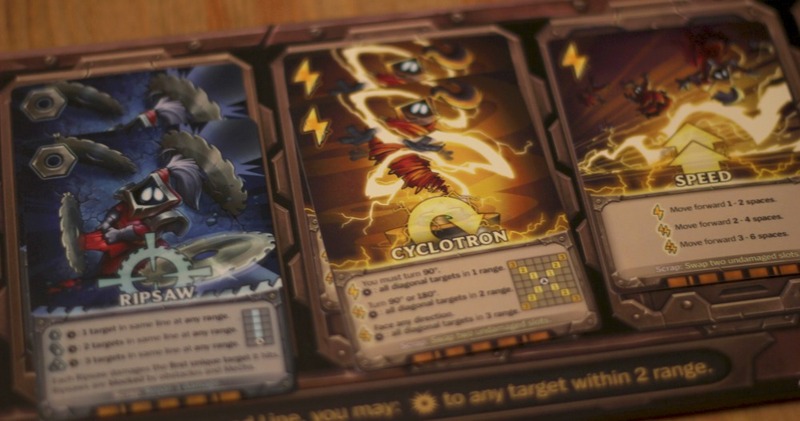 By introducing some of the cards gradually, Mechs vs Minions doesn’t overwhelm you with these choices which is nice, but you do notice yourself becoming more proficient in how you use the tools at your disposal. The different objectives also give you the chance to see the strengths of different types of card. On missions played out on long, thin play areas the infinite reach of Ripsaw in a straight line helped me thin out the ranks of minions marching our way before they could get close. When they were spawning all around us Scythe was great, taking out minions at close range as we turned on the spot. For one mission I knew that being about to reposition would come in useful so I picked Corki to be my character because he has a schematic card that changes Omnistomp (a movement command card that tells your mech to move in a straight line forwards or sideways) so that all players can move in different directions with each step of Omnistomp. That meant when the schematic was activated, instead of needing to go three steps forward or sideways all at once, you could go one forward, one sideways and one forward, wobbling your way to wherever you wanted to go. It combined neatly with another character’s schematic which let you also move backwards with Omnistomp, and suddenly we were a bomb-pushing machine, towing and shoving an explosive away from danger with something verging on efficiency! 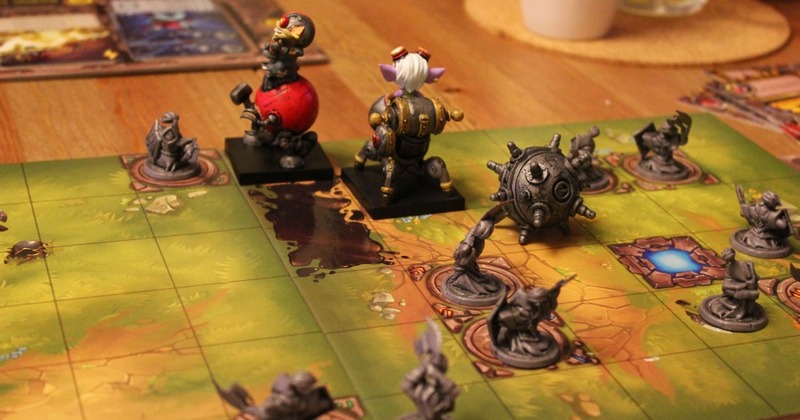 Mechs vs Minions is for 2-4 players and we’ve been playing it two-player. I spoke to the game’s project lead, Chris Cantrell, about how different numbers of players affects the game. The interview is over on RPS if you wanted to read more but he was saying that the drafting phase works to help even out the experience with smaller teams. It might be a bit harder in terms of dealing with particular scenarios, but you get more cards to slot into the command line during the draft phase and so your abilities scale up a lot quicker. 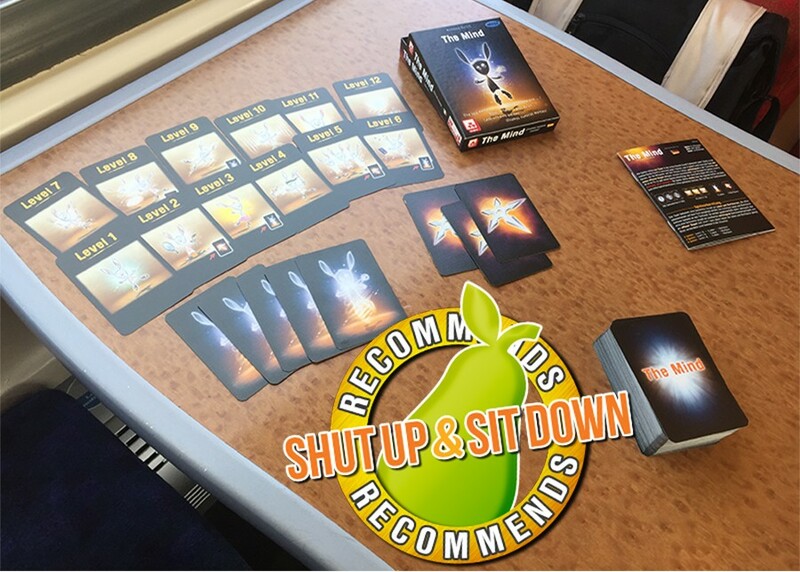 In terms of how this actually plays, we’ve found the difficulty pretty decent – there’s enough of a challenge to get your teeth into but it rarely feels overwhelming. 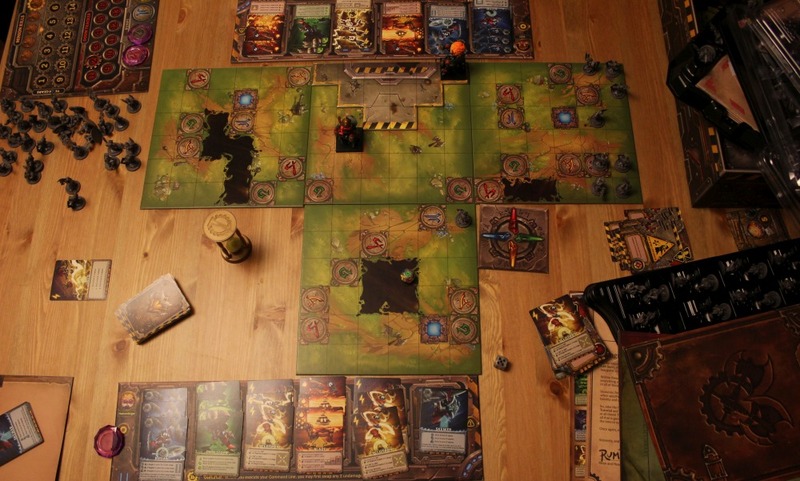 The only mission where we felt the absence of more players was one where we needed to deal with minions coming from three different directions and were struggling to deal with it as a twosome. At that point it felt like the early part of the game might be a bit grindy for two people, needing us to stay in one place and just nibble away at our foes making more fun progress. In that scenario we made a house decision to swap to the easy mode option given in the mission briefing and press onward. That’s partly a personality thing, though – others might relish butting their heads against the challenge for an evening. 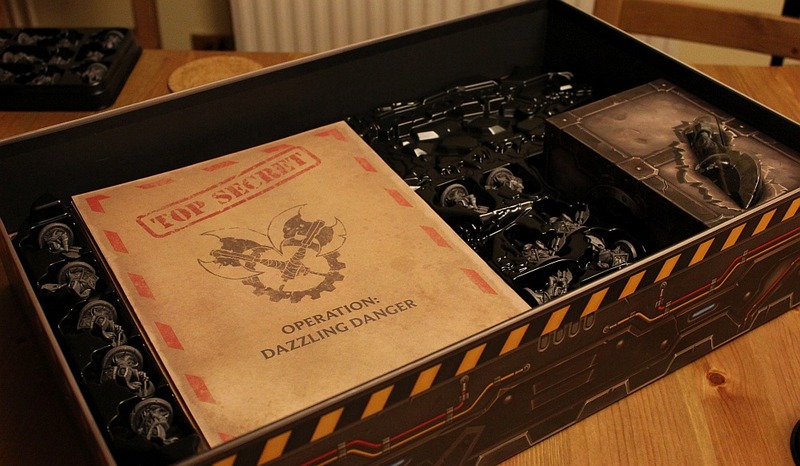 Other minor quibbles include an early mission instructing us to add extra cards to one of the decks – some missions have a little plastic bag with new cards to introduce new damage types or abilities or whatnot – and there wasn’t anything in the envelope. It might have been a sentence remnant from a previous draft of the game because everything else has been present and correct, plus we didn’t suffer from whatever it was not being included. Another element is that a couple of times the general rule book didn’t clarify a question we had, and one of the commands in the boss scenario could benefit from a diagram to accompany the card wording as Chris and I interpreted the same phrasing very differently. There’s a forum dedicated to the game online, though so I’m assuming ambiguous wordings will gradually be covered off there. We solved our problems by house-rulesing based on existing cards and trends in the game and, in one scenario, emailing Riot to double check! With regard to whether you need to be a League player to enjoy this, you really don’t. 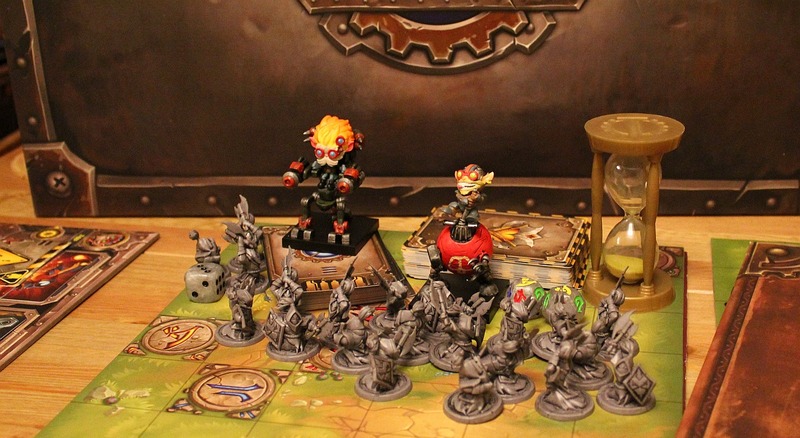 Familiarity with the game will mean you pick up on the in-jokes or little references embedded in Mechs vs Minions, and you’ll know the characters from another context, but it’s designed to be accessible to a wider audience. 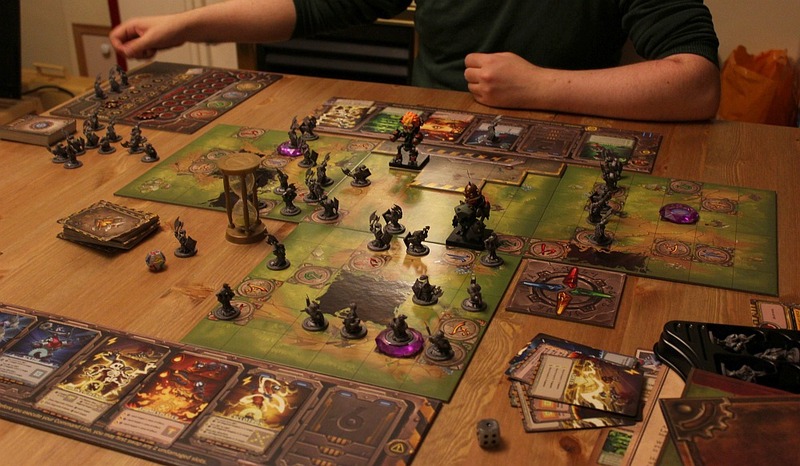 I mean, it’s called Mechs vs Minions rather than League Of Legends: The Board Game, and was designed based on an idea which was agnostic to League but which was gradually incorporated into that game’s universe. 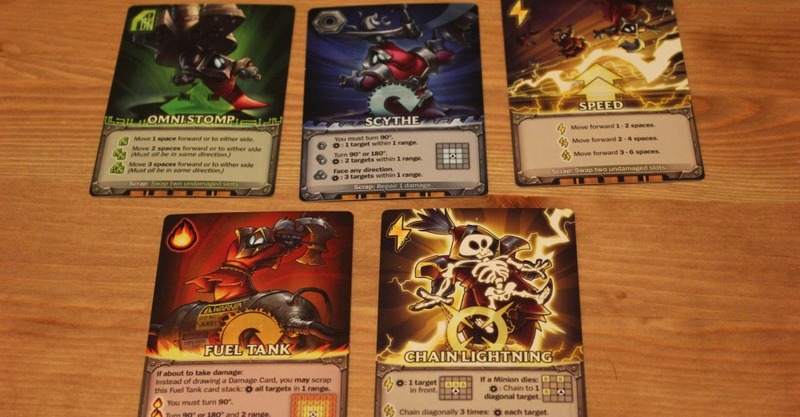 I think the only point I felt my knowledge of LoL was useful mechanically was in picking up the Chain Lightning ability, which is an electric zap that bounces diagonally from the initial target and can take out clusters of minions if you’ve souped it up. Knowing how that looks in-game meant visualising the board game version of it was easier than if I’d been reading the card as a newcomer. Actually, I put a spoiler warning up top so let’s go for it. We had one turn to kill this boss minion before it blew everything to pieces. In order to hurt the boss, we needed to first deactivate its elemental shields by stepping on a floor pad corresponding to the colour of the action card we wanted to use. Making matters worse, we needed to do two points of damage before the boss could reach a particular part of its command line. If it had been my move first everything would have been simple. I could have reached the coloured pad I needed to stand on for Chris to do his sequence of moves and defeat the boss. Unfortunately, I was going second and Chris was pinned into a corner, his damaged command line sputtering after previous rounds of combat. I was just out of reach of a vital shield-deactivating pad thanks to a damage card forcing me to rotate in an unfortunate direction. We made the executive house decision to “sod the timer” (technical term) and enjoy the puzzle. There must be a solution in there somewhere! It had reached that part of the evening where my own brain was struggling to hold more than four bits of information in a straight line so I decided to do my best impression of thinking really hard while I drank my cup of tea. I mean, when you’re dealing with card drafts, sometimes you just end up in impossible situations. I should know. I have played clock patience. But Chris had reached that part of the evening where he had the slightly manic look of a man who refused to be beaten by a card draft no matter how many obsessive hours it took to beat the game into submission. His eureka moment was this brilliant bit of late night clarity which bobs to the surface of the evening, then threatens to disappear beneath the waves again while you try to wrestle it into your brain boat and into words. He fumbled for accuracy while telling me what to do so explained it by just pushing cards into my hands and playing out the whole move while I watched. It involved rearranging my command line rather than fix the glitch, incorporating the forced turn into a strafing move that pushed me onto an oil slick, sliding my mech all the way onto the correct pad. Then, one of my rearranged cards turned me to face the boss so I could hit it with a long-range weapon.One damage done! The second damage would come from a card that Chris thought was rubbish at first – a fuel tank that you can choose to detonate when you take a hit. Chris allowed his mech to stumble about in the corner, making sure he stayed close enough to the boss to take damage. The boss swung an axe at him just before getting to the [REDACTED] step on its command line, setting off the fuel tank and effectively blowing itself up. We’d won! 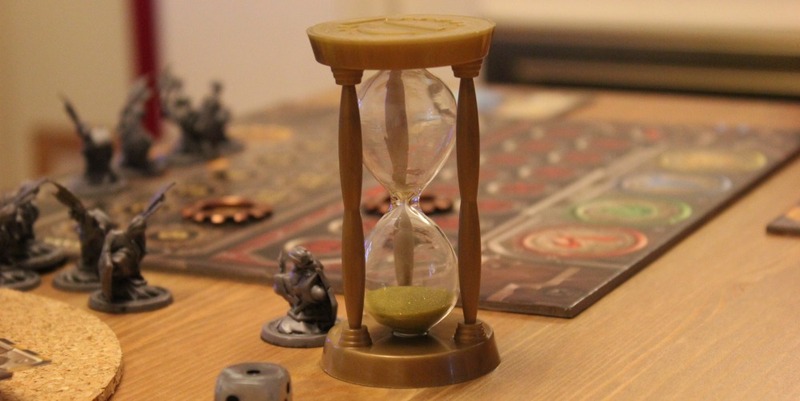 I worried about whether it was legal for a few moments because of how we’d jettisoned the timer, but that’s the beauty of board games – you can sort of house-rules it for the right story, and that climactic moment with Chris finally solving the draft felt right for our storyline because we got to walk away feeling like we’d been through the wringer but come out with this really meaningful win. If you’ve not played a campaign-based game before, this experience has been like playing through a TV box set that can fight back so moment like the above are treasured. I’m also a big fan of doing it as a two-player campaign with someone I live with as we can go entirely at our own pace. Oh, and just so you know, I like adding to the TV box set feeling of the game by opening the next mission envelope whenever we complete a mission, introducing the new chunk of story with a “next time on Mechs vs Minions”-style announcement trailer. In terms of value for money and in terms of my own enjoyment it’s been superb. 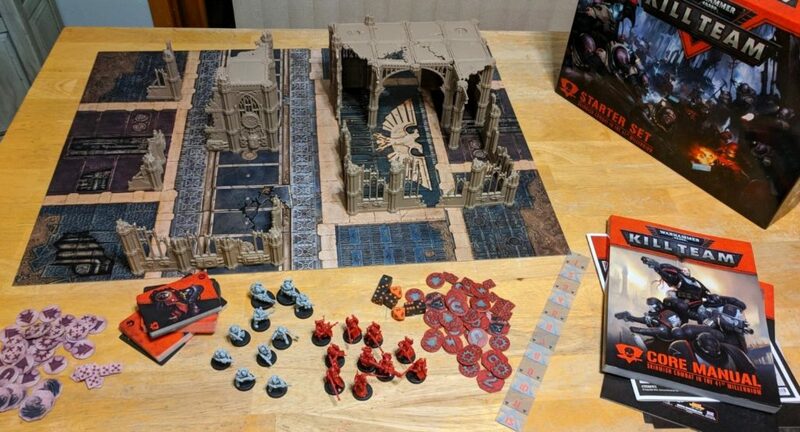 It’s also so much about these modular pieces being repurposed and remixed that I want to see whether the board game community concludes the official playthroughs and starts working out their own missions. I think I’d love to see it become almost like a level editor where you can create and offer up new challenges to each other, giving it new directions and flavours as people play. But that’s for a little way down the line. Right now, it’s a wonderfully produced game with so much variety across the campaigns. Once you’re comfy with the basics you start playing with different options, trying to combine cards and abilities in new ways. Some elements are affected by dice rolls, but their effects were never strong enough that I felt screwed over and there’s a lively, silliness to the characters and the world which helps slightly out-of-control mechs feel comedic rather than unwieldy. I’ve also been thinking about the replayability and how I’d actually be happy to go back to older missions, especially if we play with different numbers of players (Finishing the campaign also unlocks a “Hard Mode” – Quinns). All I’d need to do is fish out the cards marked with higher mission numbers from the decks. But GOOD LORD it is the heaviest board game I own so it will never leave this house again! Mechs Vs Minions goes on sale tomorrow, 13th October, from Riot’s official merch store. But the merch store is region-specific, so that’s a link to the MvM site.